When it feels threatened, the hagfish produces a slime which is only 12 nanometers wide, but 15 centimeters long – 10,000,000 times longer than it is wide. It’s not clear exactly what this slime is made of (likely a sugar modification), but its purpose is to make the hagfish slippery and possibly clog the gills of a predator. The thread is clamped into a single cell. To make thing even more interesting, the threat can withstand pressures of gigapascals, much like spider silk or steel. Hagfish are remarkable creatures. They are living fossils, remaining virtually unchanged in the past 300 million years. They are jawless and are the only known living animals that have a skull but no vertebral column. 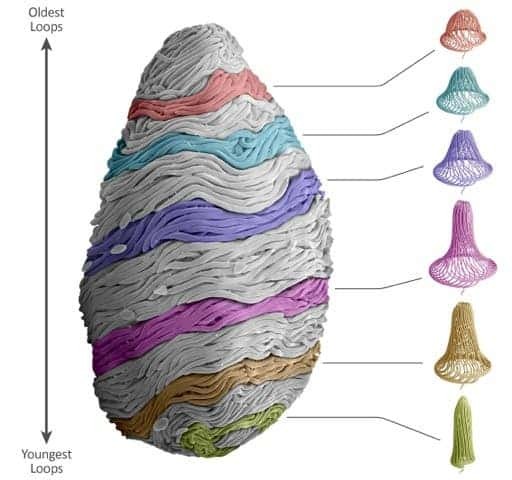 They are so strange that biologists still aren’t sure where to classify them in the tree of life. Researchers have known for quite a while that hagfish can exude copious quantities of a milky and fibrous slime or mucus from some 100 glands or invaginations running along its flanks, but until now, no one has studied in detail the characteristics of this slime – and the results were surprising. They were curios as to how they secrete the microfibrous slime, which expands into up to 20 litres (5¼ gallons) of gelatinous and sticky goo when combined with water, and how is it that they don’t get themselves tangled into it. Using electron microscopy they found how the thread doesn’t get tangled: it is coiled up in a conical “skein” in 15-20 layers, inside a highly specialized cell – a gland thread cell (GTC). The method they used is called Focused Ion Beam Scanning Electron Microscopy or (FIB-SEM); they used it to scan a fully matured GTC. The technology’s main advantage is that it allows researchers to make visual slices of the interior of the GTC, which they can then reconstruct to create a 3D representation. This research doesn’t only reveal an extraordinary biological mechanism, but it can also pave the way for a new generation of nanofibers. Industrial attempts to create strong, long lasting and cheap fibers have generally failed. Harvesting silk from the silk worm in bulk has been done with success for thousands of years, but the silk isn’t strong enough. Harvesting spider silk is not feasible on an industrial scale because it is not possible to generate a sufficient production volume (although some are working to develop this technology). It’s not clear if hagfish fibers can be the solution to this, but it does definitely paint an interesting perspective.